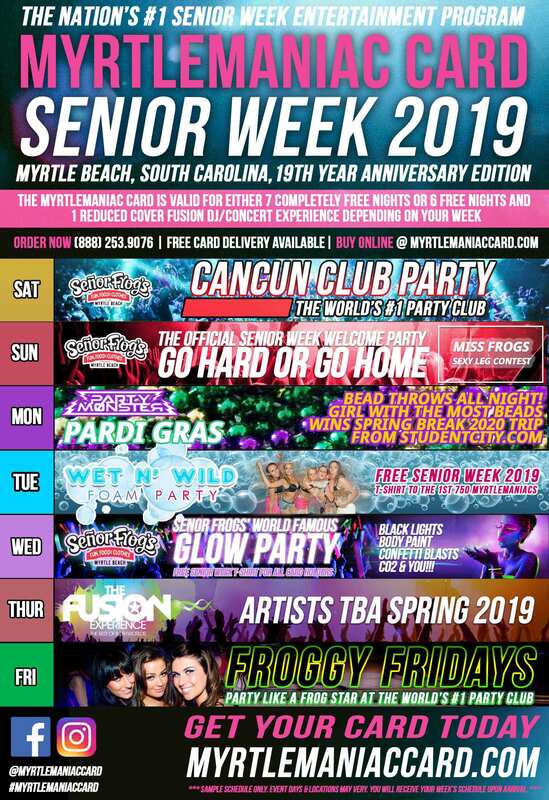 America’s #1 Spring Break & Senior Week Entertainment Package! Sample schedule only. Your weeks schedule found on the Senior Week Party Schedule Page. Over $200 in value for only $50 ($45 when using promo code “maniac” online) including: Free entry every night, MyrtleManiac drink specials throughout the week, themed events including Foam Parties, Mardi-Gras Parties, & Glow Paint Parties. Also includes amazing discounts on other entertainment, food and transportation plus a Spring Break 2019 T-Shirt. Get your Spring Break MyrtleManiac Card to save BIG $$$ and guarantee your entry into the wildest Spring Break events. Includes free covers, discounted cab rides, discounted food, discounted entertainment and a FREE Spring Break 2019 T-Shirt!